Improving at-work driver safety is becoming an increasing focus for fleet managers, with many introducing innovative measures to reduce risk. 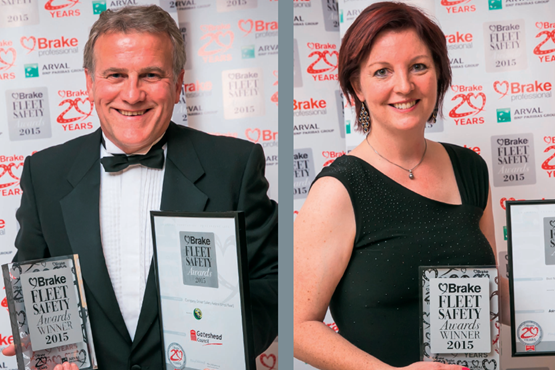 Many outstanding operators were recognised by road safety charity Brake for their contribution to improving the safety of at-work drivers at the organisation's annual Fleet Safety Awards. Among the winners were Graham Telfer, fleet manager of Gateshead Council, who won the company driver safety award (small fleet) and eco fleet award, and Astrid van der Burgt, national road risk manager at Kuehne + Nagel UK, named best newcomer to road risk management. How important is driver safety to your organisation? Graham Telfer: Over the past seven or eight years our accident rates have fallen by more than 40% and safety is a priority because we have a duty of care throughout the organisation for both drivers and the public. We consider our drivers to be ambassadors. They are the frontline staff who have logos on the sides of their vehicles and the public is encouraged to let us know what they think about our driving. It is in both the public interest and our own that we fully address our road risk policy. Astrid van der Burgt: Safety is always at the top of the agenda at Kuehne + Nagel, not just from a moral perspective, but it also makes us legally compliant and it makes financial sense. That's why the company wanted somebody on board who was dedicated to road risk, and that’s when I was hired. To have a dedicated road risk manager shows that Kuehne + Nagel is committed to safety. How do you approach driver safety? Graham Telfer: We have a comprehensive road risk policy and we also have regular training sessions and risk assessments for all our drivers. We have four advanced driving instructors who take each driver out prior to them starting work with us and following a speeding or seatbelt incident or any collision, whether it’s minor or major. If they have a collision, the driver is reassessed and they have further additional training if needed. Ultimately, if it’s required, they are taken off driving duties. Each driver also has a small driver’s handbook that addresses areas such as vehicle load, driving styles and daily walk-round checks. It isn’t a weighty document because if you give someone a 200-page document it tends to gather dust, so its brevity ensures drivers will read it. Astrid van der Burgt: Kuehne + Nagel invests in both skill and knowledge-based driver training. However, accident statistics showed there was room for improvement, so I added the behavioural side into the driver training package. After joining in 2011, I decided to use the BS OHSAS 18001 occupational health and safety management standard to build our road risk management system. BS OHSAS 18001 gives you a safety structure and work plan covering areas such as policy, risk assessments and responsibilities. Once you’ve implemented your plan, you do an audit and look where you can make improvements. We introduced initiatives such as the DVLA electronic driver licence checking system and enhanced our driving assessments to include driver metrics so that colleagues get feedback on their driving behaviour. This has led to a big improvement in safety, with a significant reduction in the number of accidents. We’ve also seen a reduction in accident costs despite our fleet size increasing. How do you use technology to increase safety? Graham Telfer: Public sector organisations have faced huge cutbacks in the past few years, so you have to be more astute when selecting what telematics system best suits your operation rather than just choosing one product for all vehicles. Also, you can have a huge amount of data overload from telematics and we simply don’t have the staff to monitor a vast amount of data. Our heavy commercial vehicles and gritters are the largest vehicles that attend residential areas every day, so we installed route optimisation systems for those vehicles so we know the best route to take in the minimum amount of time. Lightfoot is more relevant to smaller vehicles for which we want to know more about driver behaviour, such as excessive idling and erratic driving. This sends us data as a league table in tabular format, and there isn’t anyone sitting there going through reams of data. On top of that, we track lone workers – for instance, care workers who are called out to vulnerable people. Those employees may be going out at 3am so they are tracked so we know where they’re at all times and how long they’ve been at their home visit. Astrid van der Burgt: Telematics was in place for fuel usage when I started, but it became apparent that if you brake and accelerate less harshly then, yes, you use less fuel but it also means you are driving more safely. We also use in-cab cameras. Once we explained to drivers the reasons why we went for the system, they were fully on board. They felt it was a protection measure against crash-for-cash incidents, but also against problems at the delivery point. The system we use gives the driver an opportunity to record a situation that he feels could be a problem in the future. We had a road rage incident where we were able to prove to the police that it was not our driver's fault because it was recorded. That really showed how these cameras can protect our drivers. Are there any other measures which prove effective in improving safety? Graham Telfer: It doesn’t matter what walk of life you’re from, after 20 minutes sitting in a classroom listening you just switch off. When we do driver assessments or toolbox talks we use videos produced by Brake in which someone has unfortunately experienced a road accident, whether it is a family member or themselves. That changes the mindset of even the most hardened driver. Showing someone who has real-life experience of losing someone is inescapable that it is a situation someone could find themselves in through their actions. The videos from Brake, such as Too Young to Die, work extremely well. Astrid van der Burgt: We run a children’s drawing competition based on a safety theme every year. The children of all our drivers and colleagues are invited to take part and the best 12 are converted into road safety posters. The posters are displayed at our sites to remind all drivers about road safety. It also encourages colleagues to have a conversation with their children about road safety. The other initiative we’ve introduced is a driver of the year competition. We are looking for colleagues that have gone above and beyond the norm to demonstrate and promote road safety. Winning the driver of the year title has become really prestigious, and now all our drivers want to be nominated for it.